Don't Do This Unless You Want SPAM, It's Dumb! The bane of all business owners is Spam. We can waste so much time filtering and dealing with it, even with all the great tools out there. But some people seem to have more of a problem than others. Why? How did they get your email address to start with? Spam bots and email scrapers! In their zest to “knock out” websites. Easy for the web visitor to contact you. Sooner or later the spam bots will get it, then that email address is burned, only forever. What can you do about it? Nothing, it’s burned. Get a new email account. What’s the better solution? 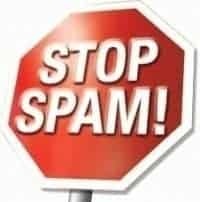 A spam free contact page that has a code to protect it against spam bots, something that us humans have to fill out. It’s a better, smarter and more professional way to go anyway. Clients love it, most contact forms have a drop down selection of reasons for contacting you, this simplifies the enquiry process. Some have a cc option too which can be useful. Anyway,l was just doing some reviews for prospects and it never seems to amaze me, here we are in 2011 and this bad web practice still goes on. Seriously, slap your web master, they’re costing you time and money! Does my head in! ← One Simple Step To Doubling Your Web Leads.